Have you headed down to The Body Shop yet to have a sniff of their new Christmas ranges? If not get yourself down there right now! There are three fragrances this year, which includes old favourites Frosted cranberry and Vanilla brulee, and then a new fragrance for 2014, Glazed apple. As soon as I heard there was going to be a Glazed apple hand cream I was desperate to get my hands on it. My boyfriend's local store was a bit slow getting the Christmas ranges in, but I finally got my hands on it last week. When I got to the till I was told that the hand creams were on 3 for 2, so I thought I might as well take the opportunity to grab one of each of the fragrances. I've previously tried one of their new smaller size hand creams in Coconut (review here) and I loved it. The only reason I haven't bought another one in any fragrance is because I have several hand creams to get through. Obviously I couldn't pass up Christmas limited editions though could I! These are actually more of a gel consistency than a cream and they are just a complete joy to use. They absorb so quickly and leave absolutely nothing behind on the skin, apart from a beautiful scent. These are the only hand creams I'm happy to use during the day because I can apply them and then just get on with what I'm doing. I hate having to wait for creams to be absorbed or trying to do things with sticky/tacky hands. Fragrance wise I'll start with Vanilla brulee. I'm not very good at describing fragrances but I wouldn't say this is a traditional vanilla product type scent, I would say it's a creamy vanilla essence type smell. Out of these three this is probably my least favourite, but that doesn't mean I dislike it at all. I believe the frosted part of Frosted cranberry might refer to sugar (the picture on the tube looks like a sugar covered cranberry) as this is what I would expect sugar covered cranberry's to smell like. This one has a sweet berry scent. Finally, Glazed apple definitely has to be my favourite. If you're only going to buy one product from the entire Christmas range I would recommend making it a Glazed apple product. This has a sweet, crisp, tangy scent that makes my mouth water whenever I catch a whiff of it. As I mentioned in my review of the Coconut version, one of the things I love most about these is that the scent really lingers on your hands. I can't really say how long Vanilla brulee and Frosted cranberry last, as I usually apply them before bed, but I can often still faintly smell Glazed apple in the morning. There's nothing I don't love about these hand creams as they're an absolute bargain for just £3.50 each. I think I might have to nip down and stock up on a few more Glazed apple ones! 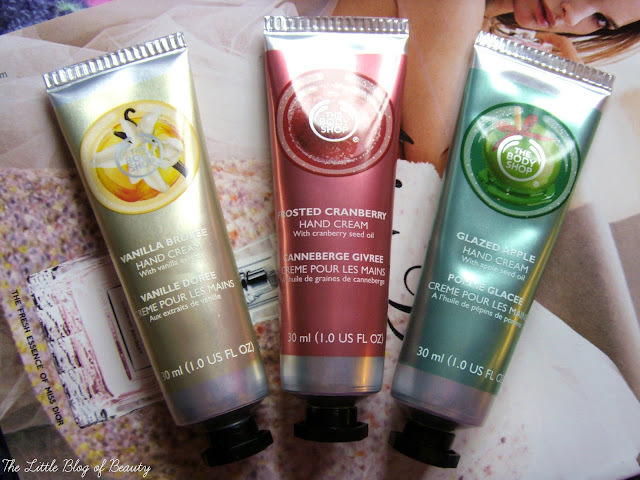 Have you tried any of The Body Shop's mini hand creams? I want to try them all! :-) but the glazed apple one does sound particularly yummy!